638 pages | 77 B/W Illus. 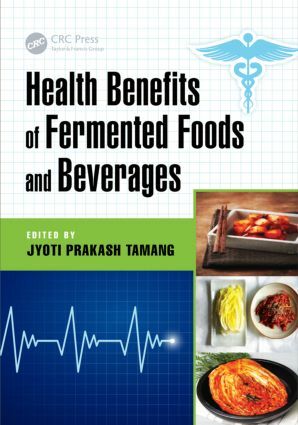 Health Benefits of Fermented Foods and Beverages discusses the functionality and myriad health benefits of fermented foods and beverages of the world. It examines health-promoting and therapeutic properties, covering the molecular process of fermentation and the resulting benefit to nutritional value and long-term health. Exploring a range of fermented food products from yogurt to tempeh to wine, the book details probiotic activity, degradation of anti-nutritive compounds, and the conversion of substrates into consumable products with enhanced flavor and aroma. The diversity of functional microorganisms in fermented foods and beverages consists of bacteria, yeasts, and fungi. The most remarkable aspect is the biological functions and the enhanced health benefits due to functional microorganisms associated with them. Written by a host of international experts, the book highlights the microorganisms in fermented foods and beverages of the world. It collates information based on research articles and review papers investigating the different health-promoting benefits such as antioxidant functions, allergic reactions suppression, and overall digestion improvement. Possible health benefits of fermented foods and beverages include prevention of cardiovascular disease, cancer,hepatic disease,gastrointestinal disorders and inflammatory bowel disease,hypertension,thrombosis, osteoporosis, allergic reactions, and diabetes. In addition, fermented foods list increasing the synthesis of nutrient, reducing obesity, increasing immunity, and alleviating lactose intolerance as well as anti-aging and therapeutic values/medicinal values among its health-related effects. The list grows the more we know about their molecular processes and their biological functions. The book helps you overcome the challenge of large-scale production and bring to consumers fermented foods without losing the unique flavor and other traits associated with the traditional products from which they are derived. Professor Jyoti Prakash Tamang has been one of the authorities on global fermented foods and beverages for the last 27 years. He earned a PhD in microbiology from North Bengal University (1992), did postdoctoral research work at the National Food Research Institute, Tsukuba, Japan (1995), and at the Institute of Hygiene and Toxicology, Germany (2002). He was awarded the National Bioscience Award of the Department of Biotechnology by the Government of India in 2005, and the Gourmand Best Cookbook Award in Paris in 2010. He is a fellow of the National Academy of Agricultural Sciences (2012), the Indian Academy of Microbiological Sciences (2010), and the Biotech Research Society of India (2006). He has published more than 120 research papers, and authored several books including Himalayan Fermented Foods: Microbiology, Nutrition, and Ethnic Values, and Fermented Foods and Beverages of the World, both published by CRC Press, Taylor & Francis Group, USA in 2010. He has one patent, and has mentored several PhD students. He is a member of several prestigious national and international academic groups including the International Yeast Commission and the Asian Federation of Lactic Acid Bacteria, among others. Dr. Tamang is a professor in the Department of Microbiology and also dean of the School of Life Sciences of Sikkim University, a national university in Sikkim. He has served as the first registrar of Sikkim University appointed by the president of India.